This is a greater starter for any spring menu. Bear Garlic is one of the first plants to grow in spring and people normally pick it themselves when doing a walk. If you try to pick it on your own, you should be aware that there is a very poisonous plant, that looks almost the same – so do not pick it if you do not know it. I love this soup when it is properly prepared – if the cook picks just the right amount of bear garlic it gets a nice spicy, garlic aroma and with its green colour its a beauty to watch. If you do not like Garlic, you might exchange this soup for a spinach soup. Easter Ham is a very traditional main course for Easter. You get it mainly in two variants – the cooked ham gets put into bread dough and is then baked or the version I want to introduce you to. Here you prepare Sauerkraut and cook the ham in the same pot as the Sauerkraut. The cut potatoes are prepared in this pot as well. This dish is rather easy to produce and it was put into the oven before people went to church – so when they came back, lunch was ready and people could enjoy Easter Sunday. I suggest you have a good glass of white wine with this dish. This is a typical cake. Its name derives from the cake tin which looks like a lamb. The cake itself is made out of eggs, some vanilla, flour and some lemon. If you are in Austria around Easter time you can buy it in almost every bakery. To conclude my Easter Special I want to introduce you to the traditional custom of Eierpecken. 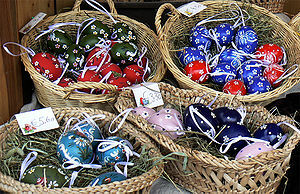 Easter time is special – the eggs are colored and they are delivered by Rabbits not by chicken. Most of this customs base on pre-christian customs that were strong within the Germanic tribes. Ostern (german for Easter) comes from the old germanic godess “Ostara”, who was the godess of spring. A lot of this customs were introduced and adapted by the Christian missionaries in the 5-10th century and are now important parts of the Easter activities. “Eier Pecken” is a game, which is mostly played by kids, but adults are often proud to show, that they can win the game. To play it you need some hard boiled eggs and two people. Every player has one egg and puts it into his hand – now the apexes are crushed together. The players whose egg is not damaged gets the damaged egg of his rival. Its all a matter of concentration and well paced force. I hope you liked this article and I would be very happy to get some information about your traditional Easter meals and customs. I want to thank my mother, for providing me with todays “Featured Image” – this was taken in her flower shop – Blumen Akzente.